When my daughter and her friends were setting up for a Students for Israel event at Hunter College, they brought enthusiasm, informational materials and a very thick skin. That’s because for some students at CUNY, if you’re a Zionist, you’re a murderer. And you definitely do not belong at the City University of New York. A member of Students for Israel invites these onlookers to their events, hoping they’ll come. “We want dialogue,” my daughter says. But the invitations are met with derision. This particular friend attended the Million Student March, a nationwide rally this past fall in favor of free tuition. Hunter students held their own rally as part of this effort; yet the march was coopted by SJP, where chants of “Long live the intifada,” and others aimed at CUNY’s “Zionist” administration turned into threats toward this young man, whom they threatened to drag down the street. Another friend, who my daughter has known since childhood, attends List College, the joint program of Columbia University and the Jewish Theological Seminary. She’s really down about the apartheid wall that the Columbia chapter of SJP erects on the campus. My daughter and her friends are day school graduates. They grew up with Israel in their hearts and Judaism in the air they breathed. The two girls attended United Synagogue Youth events, and Camp Ramah, where they eventually became counselors. All three of them went on gap-year programs to Israel last year, where they lived with Israelis, and saw the country in breathtaking diversity. When my daughter entered Hunter this fall, I did not expect that she’d be facing what feels to me like open discrimination at the hands of other students. If my child hurled the sorts of insults you read about in college news reports about SJP events, I’d be ashamed of her. And she would probably be accused of hate speech. If Hillel indulged in the type of activity that the much larger SJP does, its chapters would be told they were making students feel unsafe. But apparently, when the minority being insulted is Jewish, safe spaces aren’t the issue. Only the other day at CUNY, the Doctoral Students’ Council passed a resolution calling for an academic boycott of Israel. It passed 42-19, with nine abstentions. The resolution included support for SJP. Yet calls to ban the group are misguided. It only strengthens their position. My daughter is angry about the call from ZOA (Zionist Organization of America) to cut the CUNY budget because of anti-Semitism. She says it just hurts the people ZOA wishes to help, by making Jewish students targets for more hate. Millennials and Gen Z students now at college are sympathetic to the underdog and social justice causes, which we are witnessing in the way they fuel Sen. Bernie Sander’s campaign for president. I fear that we have failed them, first in not educating them well enough about the dire necessity of the state of Israel, and second, by not substantively acknowledging and hearing their concerns about the plight of the Palestinians. This impulse of ours to clamp down on all debate on the topic hasn’t served us very well. 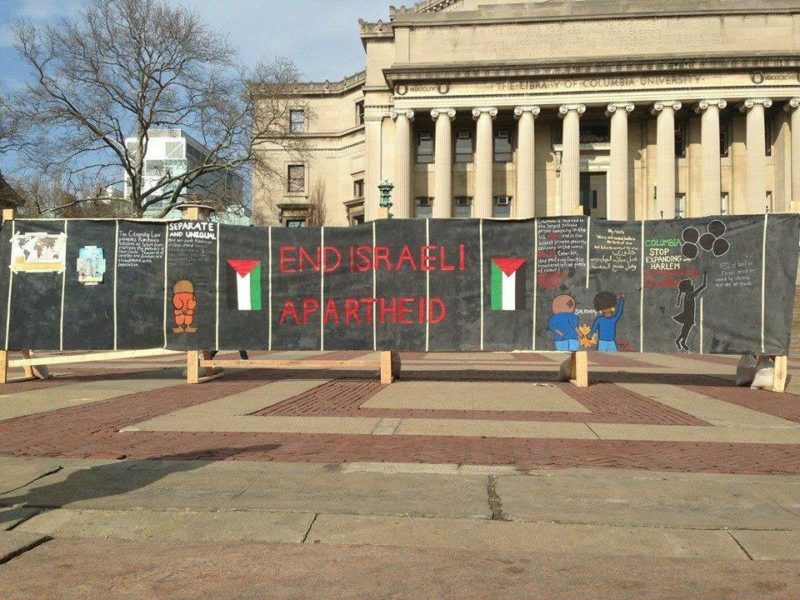 When I attended Barnard College, Columbia’s undergraduate college, an eternity ago, I could not have imagined an “apartheid week” aimed at Israel. South Africa was not even yet a cause then. Barnard and Columbia were so overwhelmingly Jewish at the time, that, I, as a freshman from Texas who attended a high school with perhaps a dozen Jews, could barely recognize that this surfeit were my people. I could never have fathomed then any Jewish student protesting Israel. It’s gut wrenching to think of them doing it today. But I attended college only seven years after the Yom Kippur War. I remember going to synagogue that day. People looked stricken, and a low buzz of angst, one that I didn’t quite understand, rippled through the congregation. Only a year earlier, Israelis were murdered at the Munich Olympics. Threats against Jews were very real in the early 70s, not quite three decades since the end of World War II and the Shoah. The first intifada began only three years after I graduated college and ended (more or less) three years before my son, my first child, was born. My children’s generation knows only an ascendant, strong Israel, of high tech wonders and creative cuisine. It is an Israel, that depending on your point of view, has held onto the West Bank for security reasons, or colonized it, for nearly half a century. Although both my kids have the kind of education that (you hope) prepares them for SJP, most Jewish college students do not. And even those who do cannot shout down SJP’s emotional appeal with a good fact or two. Facts simply don’t enter into this fight. SJP’s antics don’t surprise my husband. He attended college in England in the 1970s. Already kaffiyah-wearing students were making Palestine’s case on European college campuses. His friends in England today are much less prone to supporting Israel publicly than our friends here in America. If you do the math, you can figure out that most European leaders of of today were probably educated around the same time my husband was in school, and you see their tilt toward Palestine and away from Israel with each passing year. Their fear of the Muslims in their midst certainly doesn’t help. SJP and its progenitors have taken a very smart and very long view. The war won’t be won against Israel’s military might. The war will be won with every unsafe space they create for Jews on campus. It will be won each time they conflate #BlackLivesMatter with #LongLivetheIntifada. But it’s one we cannot afford to lose. At Passover we are told that in every generation someone has sought our destruction. But we don’t need to look to the Haggadah to remind us—SJP is happy to do so on college campuses every day. The key is to help our students/children fight back. The question is HOW?